The human red blood cell is functionally specialized for transporting oxygen. In order to maximize oxygen capacity, it has no nucleus or organelles, consisting primarily of plasma membrane and hemoglobin. This made it an ideal candidate for membrane studies. Interestingly, when scientists looked at the lipid bilayer of the red blood cell, they found that the phospholipid composition of the individual monolayers was quite different. The monolayers exhibited lateral heterogeneity, where specific lipids and proteins cluster together in a patchwork fashion. This diversity was enhanced by the observation of transverse asymmetry of lipids and proteins in the two leaflets of the bilayer. The outer monolayer contained phospholipids with choline in their polar head group such as phosphatidylcholine and sphingomyelin. Conversely, inner monolayer phospholipids were those with a terminal primary amino group, namely phospatidylserine, and phosphatidylethanolamine. The phosphatidyl inositols are also located on the cytosolic side of the bilayer. Cholesterol is distributed evenly throughout the two monolayers. Although most phospholipids are neutral at physiologic pH, phosphatidylserine and phosphatidylinositol have a net negative charge at physiologic pH. Being present predominately in the inner leaflet, these two lipids generate a significant difference in charge between the two leaflets of the lipid bilayer. This generates a functionally relevant asymmetry in the membrane. In particular, membrane lipid asymmetry is important for signal transduction. Phosphatidyl serine is a binding partner for signaling proteins such as protein kinase C. However, the appearance of phosphatidyl serine on the outer leaflet of the cell membrane is an indication of a loss of membrane integrity. Extracellular expression of phosphatidyl serine targets the cell for engulfment by macrophages and is widely used as a diagnostic marker for apoptosis. 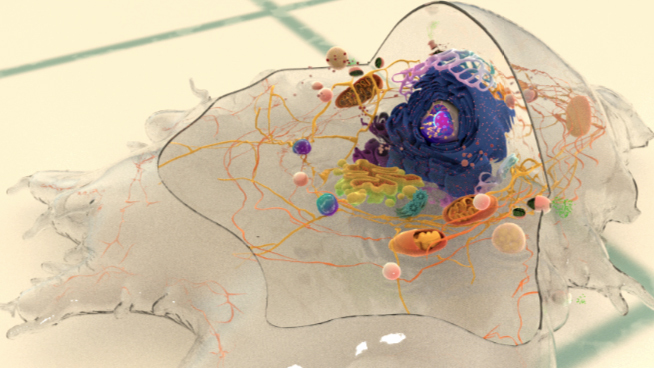 Maintaining membrane lipid asymmetry is therefore highly important for cell homeostasis. 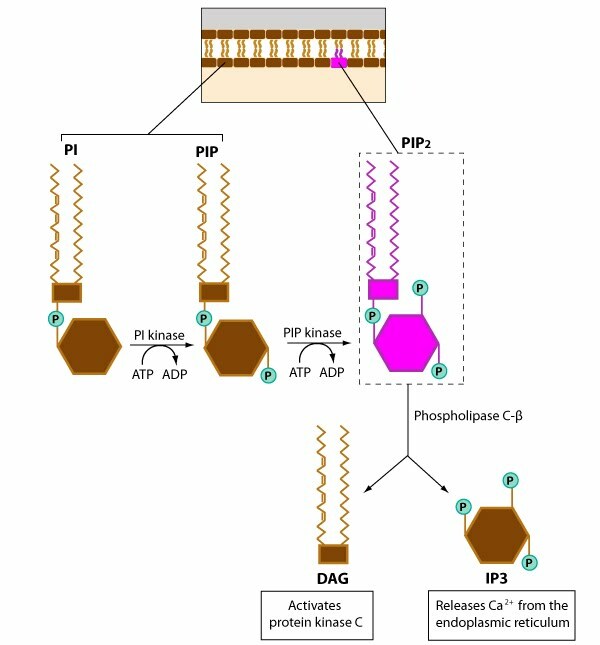 This figure gives an example of how different phosphoinositides are produced from phosphatidylinositol by the action of two kinases (e.g., PI kinase and PIP kinase) and it shows how signaling molecules (e.g. PIP2, DAG, IP3) are generated. It should be noted that a number variations exist for which hydroxyl groups are phosphorylated, and not surprisingly, a number of kinases are involved in these phosphorylation events. DAG= diacylglycerol; IP3=inositol triphosphate. What roles do phosphoinositides play in actin filament dynamics? • Phosphatidylinositol-4-phosphate (PIP) – increased levels of PIP in the plasma membrane greatly reduces the F-actin binding and depolymerizing activity of ADF (actin depolymerizing factor). • Phosphatidylinositol-4,5-bis-phosphate (PIP2) – increased levels of PIP2 in the plasma membrane inhibits actin filament capping by capping protein and greatly reduces the F-actin binding and depolymerizing activity of ADF. 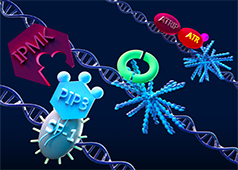 • Phosphatidylinositol-3,4,5-trisphosphate (PIP3) – Phosphatidylinositol-3-kinase (PI3K) and PTEN (Phosphatase and tensin homolog) signal transduction pathways regulate the level of PIP3 in response to extracellular guidance cues during filopodia motility. 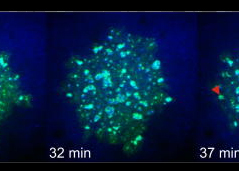 The accumulation of PIP3 in filopodia is suggested to cause actin polymerization and increased cellular movement. The membrane asymmetry in lipid and protein composition led to the proposal of the bilayer couple hypothesis. This states that the two monolayers of the membrane bilayer may respond differently to various forces while remaining coupled to each other. This hypothesis is the basis for the possible shape changes observed in membranes.